I invite all of you to join me in coming up with an ancestor guest list for your Christmas Dinner. If you don't celebrate Christmas, feel free to choose a different holiday. This is the last ancestor I am putting on my Guest list in my plan to invite 10 ancestors to join our family to celebrate with a traditional Turkey Dinner. Please think about who you want to invite and tell us why you want to have them at your table. Would you have a gift for them under the tree? What would it be? The last ancestor I'm inviting for Christmas dinner is my grandmother Ruth. 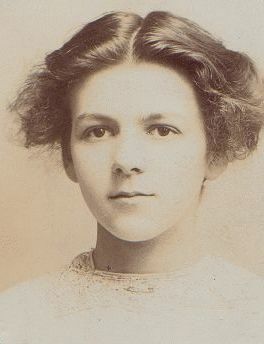 She was born in 1896 in Ramsgate Kent England and came to Canada at the age of 19 with her fiance. Grandma Ruth meant the world to me. I admired her so much. She'd been married three times (no divorces, all her husbands pre-deceased her), always wore red and like to show off her legs whenever she could! I thought she was exciting and dramatic and fun to be with. So I'm inviting Grandma Ruth because I miss her. I want to see her again and talk to her and laugh together. Grandma helped me through some less-than-happy times when I was a teenager and I wish I'd spent more time with her in later years than I did. For her gift I am first going to give her so many hugs she will not know what to do. Under the tree will be her ruby ring that she loved and which eventually came to me long after her death. I wear it every day but I want her to have it again because I know how happy it made her.